It has been reported that a healthy baby girl has been born in London, following the world’s first transplant of an entire ovary. The 39-year-old mother conceived naturally after receiving the ovary from her twin sister. Others have given birth after receiving smaller pieces of ovarian tissue. A UK specialist said the procedure should be used to preserve fertility before cancer treatment, rather than to try to extend it. The baby, weighing 7lbs 15 oz (3.6kg), was born to a German-born woman married to a Briton, who became infertile at 15 when her own ovaries failed. It was reported that she did not actually intend to become pregnant, instead hoping that the transplanted ovary from her identical twin could relieve the symptoms of her early menopause and restore her periods. The ovary was implanted with a minimal risk of rejection by her body, using delicate microsurgical techniques to reattach it to its blood supply and hold it in place alongside the fallopian tube, so that eggs could be expelled and travel down the tube towards the womb in the normal way. 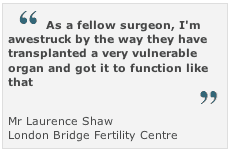 Dr. Sherman Silber, who carried out the transplant operation at the Infertility Center of St Louis, Missouri, announced it to the American Society of Reproductive Medicine Conference in San Francisco. He told the conference that the full ovary transplant was likely to last longer than strips of ovarian tissue, and might allow a woman’s ovary to be removed and put back after extended storage.